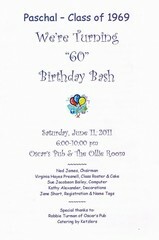 Our 60th Birthday Bash was a HUGE success! We had a wonderful group of classmates at Oscar's Pub to celebrate each other's milestone birthday! For those of you unable to join us, WE MISSED YOU! Ned James orchestrated it all beautifully, music, videos, food, bar. sounds from the 60's you're missing something great! He had two screens going with videos of the 60's that took us back in time! into a Purple & White Panther Den! manned the check-in table and were first to see every classmate! taking photos and providing the delicious Birthday Cake! Sue Jacobson Bailey ran the website. 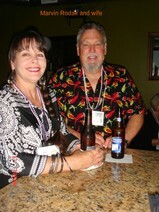 Fay Evans-Martin & Noel Ice served as "Smiley's Party Pics"! of everyone in The Ollie Room and Fay holding the ladder and passing cameras to him! Probably not, but you can imagine it, can't you? Our generous UNDERWRITERS made it ALL possible! We thank you for a fabulous evening! We feel CELEBRATED!! Where were you June 11th?